Golf professionals from Idaho, Wyoming, Montana, Nevada and Oregon will gather this weekend in Idaho Falls for the annual meeting of the Rocky Mountain Section PGA (RMSPGA). They will induct three men with long and deep connections to golf in the five-state region into the inaugural class of the new RMSPGA Hall of Fame this coming Sunday. Which means Valley Club Golf Director Warren “Stoney” Brown will have to give a speech. Brown along with the late Paul Allen of the Yellowstone (Mt.) Country Club and the late Don Hamblin of Twin Falls Municipal are the first three inductees into the golf shrine. Hearing Brown speak about his 49 years as a golf professional while not giving away his favorite fishing holes will be a highlight of the weekend. Most likely he will focus on his respect for golf and the people who adhere to its traditions. “Golf is a hard game, very hard,” Brown said last week in his Valley Club office. “Golf should be a challenge. It isn’t for everyone and it shouldn’t be made easier. But I still love it. I used to hit the ball a lot farther, but I still hit it flush. His long career has exemplified the best golf has to offer—firm adherence to the game’s rules and decorum, the importance of properly dealing with the public, encouraging young people and other vital ways of promoting of the sport. Teaching golf has always been one of Brown’s strengths. His best lessons occur on the driving range and take only 30 minutes. Within the first 10, he identifies the source of the problem, becomes acquainted with the golfer and learns the information they seem to want and would be receptive to. The final 20 minutes are spent practicing the new knowledge. Brown prefers a student who admits his swing is seriously flawed and wants to start over from the beginning. Brown uses the “teaspoon” approach over the “scoop shovel” method of correcting common problems. “You can’t give someone five things to work on. You have to fix one thing at a time,” he said. His admirers are many. They will be reminded of Brown’s influence during tributes at Sunday’s awards fete. Valley Club general manager Barry Bevers said, “Having known and worked with Stoney for over 23 years, there is no one more deserving of such an honor. Stoney Brown has more firecracker money than anyone in town because of a strong Midwestern work ethic that continues to this day, as he approaches his 68th birthday this summer still working 40 hours a week at the Valley Club. Now in his 11th summer as Valley Club golf director, the man from Missouri loves golf, collecting golf memorabilia, writing poetry and his wife of 33 years Shawna. He really loves fly fishing. Growing up in rural Memphis, Mo. near the Iowa line, Brown worked on his grandfather’s farm in the town of 2,700. He and his sister were raised by a single mom, who had returned to college to become a teacher and support the family. Brown learned about money during those formative years in Memphis. He really profited from earning 50 cents a pound for all the fish he could catch, starting with catfish and working from there. He got good at fishing, really fast. “I had more firecracker money than anyone in town,” he said about his early entrepreneurship. The family moved to Phoenix, Arizona when he was 12 and Stoney played four years of tennis in high school. It wasn’t until his senior year in high school that he played golf on a nine-hole course with sand greens. Brown’s learning curve in the sport was rapid. He soaked up all its many details and peculiarities. In high school, he was a decent Straight-A student but acknowledged that his focus wasn’t the best. He was looking for structure and found it in golf around 1965. His first job while in college at Arizona State University was in the bag room at Paradise Valley Golf Course in Phoenix. In a short time he was working in the golf shop, then he became assistant pro—just two-and-a-half years after first picking up a golf club and taking his first crisp shot. Brown left ASU during his junior year and headed north to Casper, Wyo. as assistant pro to Larry Parker at Paradise Valley Country Club in Casper. By 1969, he was ready to take the assistant professional job at Cherry Hills Country Club in Englewood, a suburb of Denver, Colo.
One of the West’s great golf courses, Cherry Hills is most famously known for hosting the 1960 U.S. Open when Arnold Palmer charged from seven strokes off the lead in the final round to win his only U.S. Open by two strokes over 20-year-old amateur winner Jack Nicklaus. That tournament leaderboard brought together for the first and only time in the final round three of golf greats—Palmer, Nicklaus and Ben Hogan. For Stoney Brown, Cherry Hills was where he learned the ropes from one of golf’s greatest club pros, Warren Smith, the 1973 PGA of America Golf Professional of the Year. Working with Parker at Paradise Valley and with Smith at Cherry Hills was hugely influential to the young man. “I worked at places where it was done right,” said Brown. “The 1960s were formative times for professional golf and I admired the tour players. Young people like me dreamed of wearing the custom slacks, cashmere and colorful clothes of the pros. They were revered by members and had status within the community. I just always tried to look as professional as I can,” said Brown. In 1972 while at Cherry Hills, Brown was elected to PGA of America membership. Yet his main objective in focusing more on the business of golf rather than on the competitive aspect of the game was this: Finding his own club job and becoming a head golf professional, Brown said. Never having visited Idaho, Brown in 1976 learned of a job opening at a 550-member private golf course in the Boise foothills called Crane Creek Country Club. The tight, challenging par-71 course had opened in 1963 and in 13 short years was already regarded as Boise’s No. 2 course, behind Hillcrest CC. “They had 60 applicants and interviewed six, and I was one of the six,” said Brown. He got the job, becoming Crane Creek’s third head golf professional. Brown ended up staying at Crane Creek for 28 years—one more year than his mentor Warren Smith stayed at Cherry Hills. It was a pretty good run considering that the average length of a head pro job is about six years. “I think they were very pleased at Crane Creek,” said Brown. “I was a decent player, but with my Midwestern work ethic I didn’t play a whole lot, certainly every Monday for our Pro-Ams. But they needed a junior golf program, and I got that going. As I built my career, I did a lot of educational things and attended many workshops. He has many friends and admirers including Valley Club director of instruction Tommy Sanderson and the club’s head professional Jaime Sharp. Brown has commented on his pride in seeing former apprentices rise to prominence as leaders and award winners in the PGA. Brown himself has won 19 RMSPGA awards and was nationally recognized in 1997 as the PGA of America Horton Smith Award recipient. The Horton Smith Award represents and recognizes those dedicated to furthering the education of PGA members. 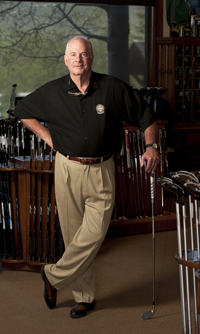 Since 1985, Brown has attended many national rules clinics and other teaching and shop operations workshops. Within the PGA Rocky Mountain Section encompassing the Snake River and Yellowstone chapters, Brown has held all the offices. While president in 1987-88, he oversaw the drawing of the boundaries of the section’s separate chapters. He was a rules official at two Ryder Cups and 10 PGA Championships, and he served for 11 years on the PGA of America Rules Committee. Twice, he has been recognized as the RMSPGA Golf Professional of the Year. Brown started looking more closely at the Wood River Valley as a possible destination in 1996, when The Valley Club opened as the Sun Valley area’s only private golf and country club. His wife Shawna, whom he married in 1981, came from Idaho Falls and always wanted to live in the mountains, having enjoyed the scenic Swan Falls area in eastern Idaho. The couple spends about a month apart each year when Brown travels to Florida and participates for 35 days in a winter tournament program for PGA pros. He leaves right after Christmas and returns Feb. 1. He gets to play more golf than he does while working in the Valley’s Club shorter season. It’s only this year at Brown has cut back on his working hours at the club. Before, until age 66, he worked 60 or 70 hours a week during the season, rising at 4:45 a.m. to arrive at work at 6:30 a.m. Now, he has two days off instead of one, and his 40-hour week provides more regular working hours.